According to the Asian Development Bank, Pakistan is one of the countries where poverty remains high. About 29.5% of the population lives below the national poverty line. For every 1000 babies born, 66 of them die before their first birthday. A major reason behind these deaths is due to malnutrition faced by both the children and their mothers. In order to help combat malnutrition in the underprivileged segments of the society, an initiative called the Roti Bank has been set up. 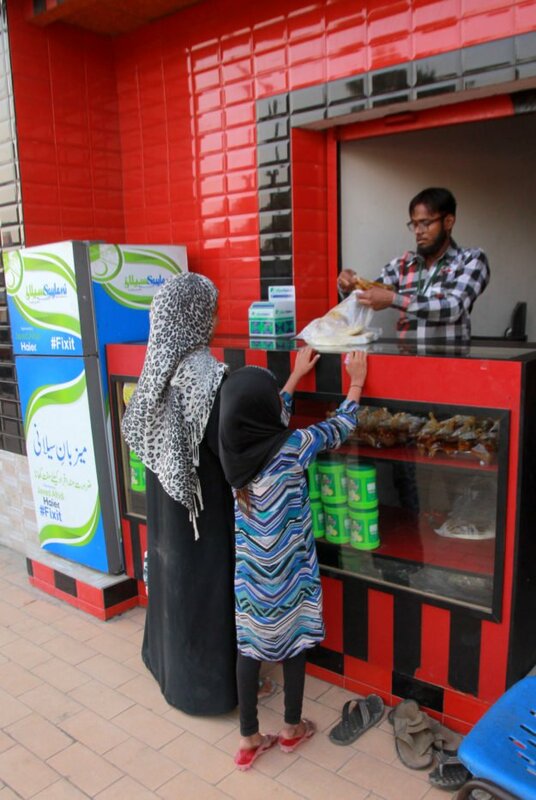 The Roti Bank, based in Karachi, is not like most of the banks out there which only deal with monetary transactions. The Roti Bank accepts deposits from donors and passes them to the poor people in the form of meals. This initiative to help the underprivileged people of Karachi is located on the road leading to Guru Mandir from Numaish. the workers in the red building who hand out food to the poor. 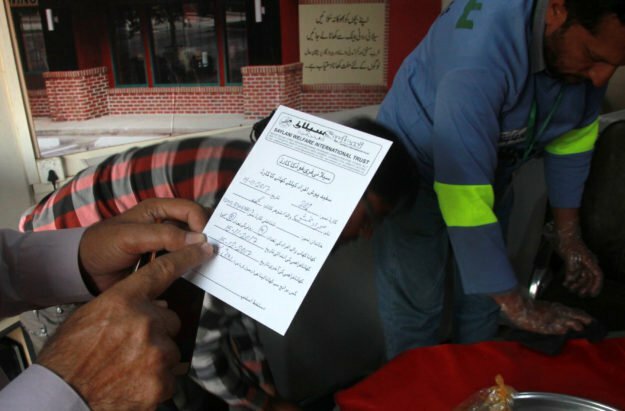 The underprivileged can register themselves with the Roti Bank and receive their free food card after submit their national identity cards and birth certificate(s) of their children. After verification, they are provided a Saylani free food card for the entire month. The Saylani card allows two meals per day from the Roti Bank. In order to protect the anonymity of its customers, Roti Bank also makes sure not to release the personal details of its registered customers. How Did the Roti Bank Start? 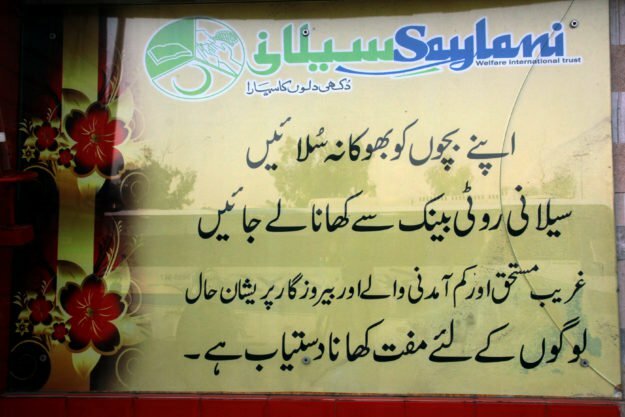 The entity behind the “Roti Bank” project is Saylani Welfare Trust. They started their first Roti Bank on 14th August this year. The reason for starting this trust was to provide free meals to the underprivileged who are unable to afford even one meal per day. They take donations from people who are willing to donate, and they only give food to the needy. Arif Lakhani, a trustee of the Saylani Welfare Trust, is also the organizer of the Roti Bank. He feels happy about how this venture is helping people who needs help the most. He mentioned that these families used to eat one meal per day and sometimes no meal at all and now they can feed their children with the meals provided by the bank. The team at Roti Bank expressed their hopes to open five to six Roti Banks in various parts of Karachi by June 2018. “On a daily basis, 700 to 900 meals are provided to people. Around 100 to 150 families have registered and will be issued cards in the coming days through which they can get food for the entire month,” he told. Here are some of the stories of the people whose lives have been affected by the Roti Bank. Muhammad Asif is a security guard who earns Rs. 12,000 per month. He pays house rent of Rs. 5,000 monthly. This leaves his family with Rs. about 7,000 a month for food and other expenses which is not much to live by. He has been taking food for his family from the Roti Bank for the past 20 days. The workers of the Roti Bank never hesitate in helping out the unfortunate. In Pakistan, it is not unheard of to see families who live below the poverty lines having many mouths to feed. Similar is the case with Azra, a mother of seven. She came to the Roti Bank to submit the relevant documents to get the food card. She further added that due to inflation the prices of groceries are increasing due to which her family can hardly eat one meal per day. Muhammad Ikram is a worker who is responsible for packing food which is eventually handed out to the people who visit the bank. 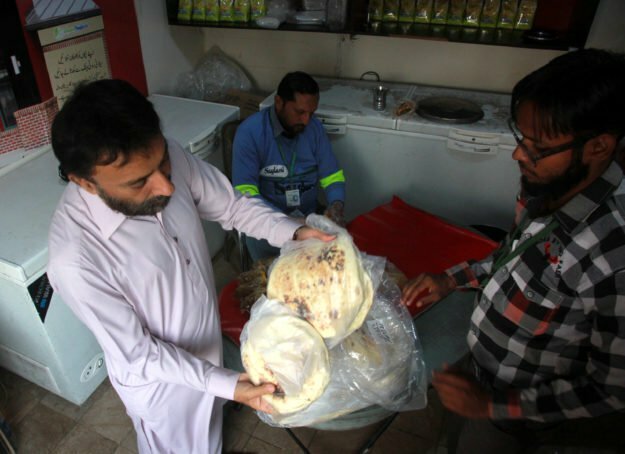 People from as far as Surjani Town, Orangi Town, New Karachi and Korangi come to get food from the Roti Bank, said Ikram, adding that the bank’s popularity is due to word of mouth. “They spent Rs 50 on bus fare and get free food worth hundreds for their families,” he said.